Meadows, fields, streamsides, roadsides, and other moist open spaces. This is a medium sized brushfoot butterfly. It has a wingspan of 1″ to 1⅜″. The upperside of the both wings is orange with a broad black border and a black-and-white fringe. There is a small to large patch in the basal area that is is mostly black with many fine, pale specks. The female is larger, darker, and more extensively marked than the male. The upperside of the forewing has four irregular black patches: a subapical patch that merges with the black border; a submarginal patch near the inner margin that merges with the black border; a median patch on the leading (costal) margin; and a median patch on the inner margin. On most individuals, a black jagged line separates the median area from the postmedian area and widens into an irregular black patch near the costal margin. On the female, the median area is yellowish-orange. There are jagged lines in the discal area that form one or two outer and a row of inner orange spots with black borders. The upperside of the hindwing has a submarginal row if pale, crescent-shaped spots within the black border. There is a broad, open, median and postmedian area with row of small black spots and jagged, interrupted, postmedian line. Jagged lines in the discal area create three rows of irregular orange spots with black borders. 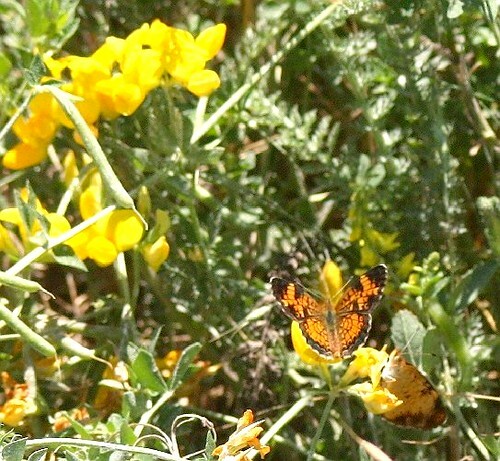 The underside of the forewing is orange with pale orange costal and apical areas; thin, jagged, dark orange lines; and two ill-defined black patches near the costal margin. 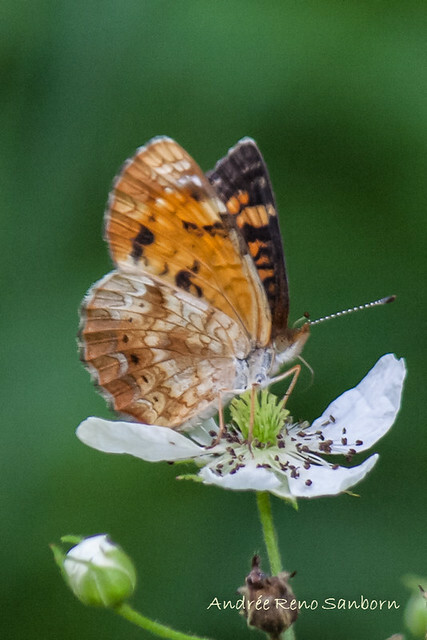 The underside of the hindwing is pale orange with thin, jagged, dark orange lines; an ill-defined, dark orange patch near the costal margin, and a dark brown patch near the trailing edge. On females, the pale areas are orangish-yellow and the lines are more highly contrasted. The antennae are black and white striped. The antenna clubs are black and white striped with an orange tip. The legs are orangish-yellow. The caterpillar is up to ¾″ long and dark brown with numerous tiny white spots. The spots are the expanded base of the hairs (seta). On the thorax and each abdominal segment there is a short, branched spine (scolus) in the middorsal, subdorsal, supraspiracular, spiracular, and subspiracular regions. The base of the scolus is rounded, wart-like, reddish-orange, and shiny. There is a broken white line in the subdorsal and subspiracular areas that extends onto the head. 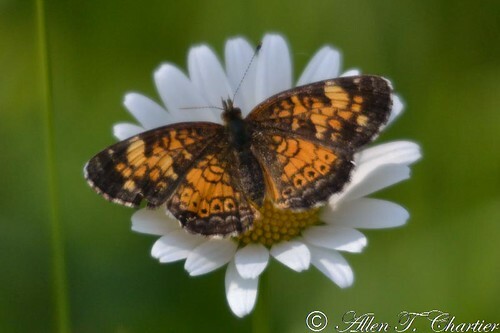 Pearl crescent (Phyciodes tharos) has a smaller speckled black area on the wing uppersides near the body. The hindwing postmedian line is continuous and unbroken. There is a pearly white spot in the brown patch in the underside of the hindwing. The flight season begins in May. White panicle aster (Symphyotrichum lanceolatum), smooth blue aster (Symphyotrichum laeve), and other asters (Symphyotrichum spp.). Flower nectar of spreading dogbane (Apocynum androsaemifolium), white clover (Trifolium repens), fleabane (Erigeron spp. ), thistle (Cirsium spp. ), and aster (Symphyotrichum spp.). The male patrols near host plants in search of a receptive female. After mating, the female lays green eggs on the underside of aster leaves in a raft of usually about 40 but as few as 20 to as many as 300. The second brood overwinters as a third-stage caterpillar. Young caterpillars feed in groups but do not create nests. The leading edge of the forewing of insects. Photographed at the Rydell NWR, Minnesota (16 June 2010). Photographed at the Glacial Ridge NWR, Minnesota (07 July 2010). Gorgeous Northern Crescent Butterfly flapping its wings.